Drums are sized according to ASME B30.7.2007 to provide a minimum pitch diameter of 18 times the nominal rope diameter. The full range of Jeamar’s heavy duty lifting winches is available with 3-phase motors in any standard voltage at 50 or 60 Hz. Winch models NLS 400, NLS 900, NLS 1400 and NLS 2000 are single phase in any standard voltage at 50 or 60 Hz. 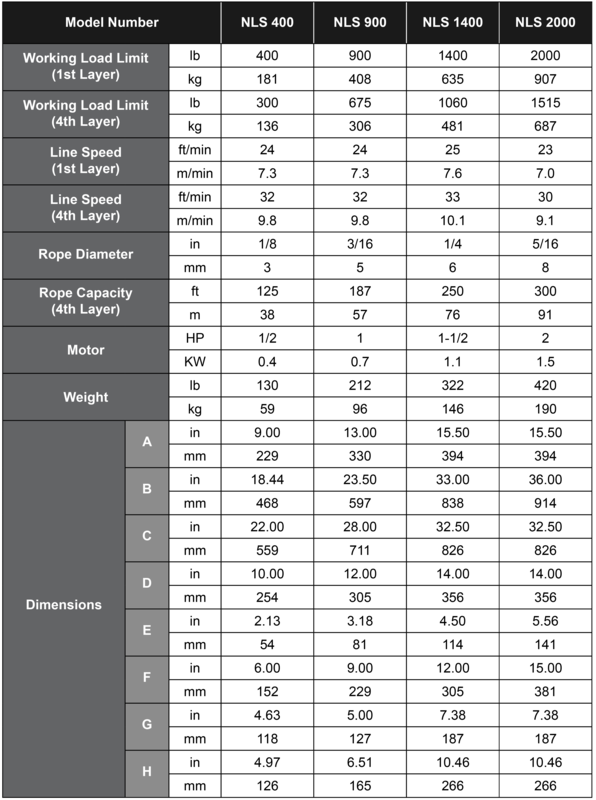 All motors are TEFC flange mounted and conform to NEMA, EEMAC or IEC specifications. Standard on all heavy duty lifting winches, the electromagnetic brake is a disc type that is activated automatically in the event of a power interruption. The brake will stop the winch and hold the load securely. Due to the high ratio of the worm gear, it has the effect of a secondary braking system in accordance with the requirements of OSHA. 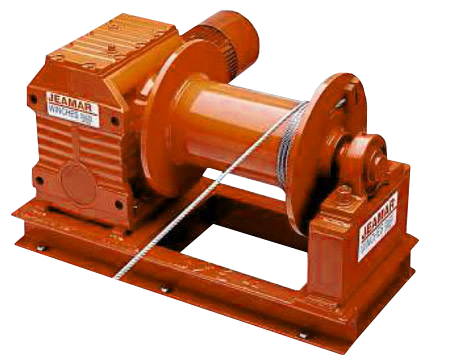 All Jeamar heavy duty lifting winches utilize high efficiency helical worm or worm reducers. Friction load loss is reduced to a minimum using ball and roller bearings. No bushings means higher efficiency and more power for pulling. A simple, direct-drive design increases the efficiency of the winch and eliminates drive chains or bull gears, to maximize power output. An open-base design permits mounting in horizontal or vertical positions. Loads can be pulled through the base itself, which is particularly useful in limited-space installations.